Victoria Justice, the American actress, and singer famous for her appearance in the Nickelodeon series 'Zoey 101' and 'Victorious' is one of the promising actresses of Hollywood. Similarly, Victoria is in a happy relationship with her boyfriend, Reeve Carney. The couple has been dating for a while so is they thinking of getting married? Victoria's love story began when she was on the set for filming "Rocky Horror Picture Show" where she met her future boyfriend Reeve Carney. It didn't take much time for the duos to hit off. The duo came out as a new couple in Just Jared's holiday party, officially announcing their love affair in October 2016. Happy happy birthday to this magical human being!! @reevecarney you are no doubt one of the most talented, unique & kind souls that I know. Thanks for making me laugh & just for being you. So happy you're in my life! ? ?#carnitas P.S. His album "Youth Is Wasted" is now streaming on Spotify & you should go listen to it now because your ears & your soul need it. Trust. ?????? They seem to be so much in love and has been spotted at several places including Victoria's birthday in February and attended the L'Oreal Paris bash in West Hollywood. The happy news of marriage, however, is yet to arrive but seems the lovers in near future are going to gives us some good news. The failure is never the last result because a better time is yet to come. Prior to Reeve, Justice was in relationships with many Hollywood celebrities. Victoria, 24, was in a relationship with Cole Sprouse, an American actor in 2004 but the relationship didn't last long as the following year, they split. Later in January 2008, she began to date the fellow star Josh Hutcherson of "The Hunger Games" but ya you guessed it right they also broke up. Shortly after her split with Josh, Victoria began dating the X-men star "Beast", Nicholas Hoult. Victoria, however, called themselves as good friends. But, what happened to Nicholas and Victoria after that is still a mystery. Again in 2011, she was rumored to be dating another actor, Ryan Rottman. After 2 years of togetherness with the "The Lying Game" star, Victoria called it quits in 2013. 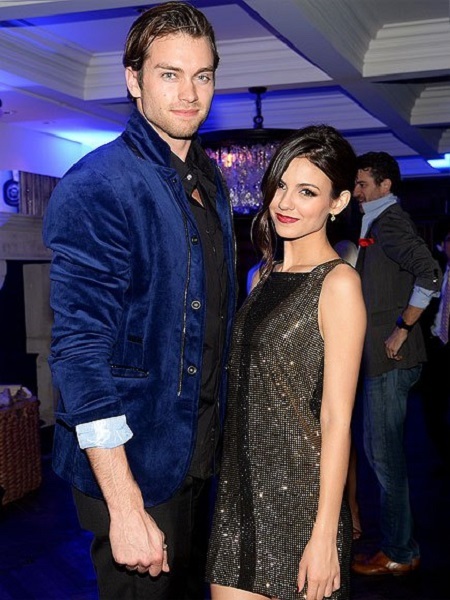 It was not so long when she began to date the "Eye Candy" star Pierson Fode in 2013. But, the perfect love for Justice was waiting for all the way to "The Rocky Horror Picture Show" as she gave another heartbreaking news of her split with Fode. "We didn’t know each other at all before filming this movie, we met at the audition and there was no romantic intention. It was super professional and we were hanging out and having a good time. It wasn’t, I guess, until after the movie was over that I went ‘Hmmm …'"
Seems, Victoria is so choosy in her relationship but now she has got her soulmate, Reeve. Was born on February 19, 1993, in Hollywood, Florida, U.S. Her height is 5 feet 5.5 inches. She has a younger half-sister named Madison. Was ranked 86 on the Maxim Hot 100 list in 2014. Her debut single "Gold" was released on June 18, 2013. Took $50,000 per episode for Zoey 101 and $12,000 per episode for Victorious. Is a model with Jet Set Models. Is best friends with Canadian male actor and Victorious co-star Avan Jogia. Has taken part in several charity events, supporting charities such as the United Nations Foundation and Charity Campaign Girl Up.